holedown starts off a bit slow. The goal of the game is to aim your balls at a certain spot and then watch as they bounce around and clear numbered bricks. The numbers represent how many hits it will take to clear a brick. The idea is to keep digging downward to reach the core. 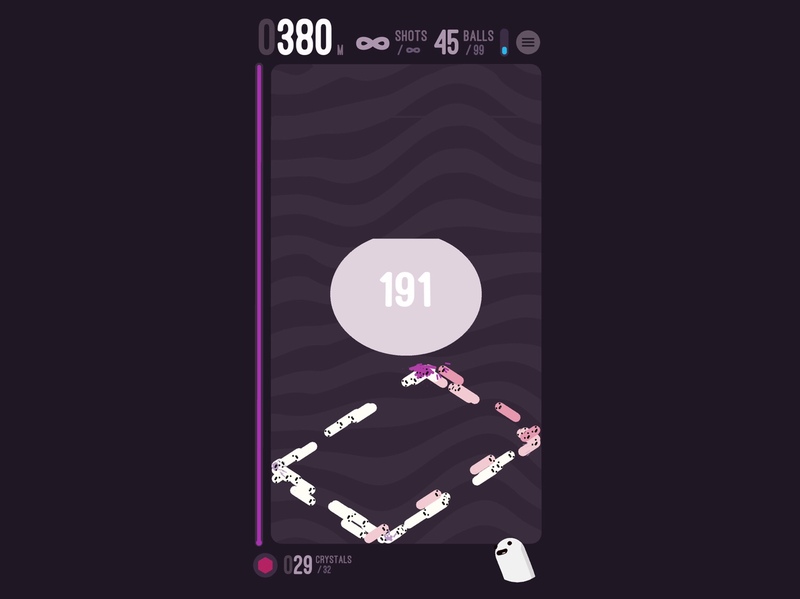 After each move, you’ll go deeper down the hole, so any bricks left higher up will inch towards the pink line at the top. If any bricks hit that line, it’s game over. 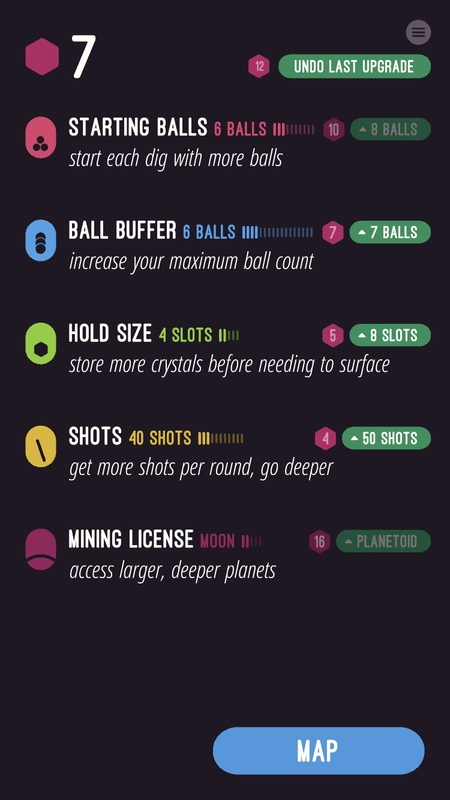 On your first game, you’ll only have two starter balls and twenty shots. This means you can shoot two balls at a time twenty times before it’s game over, though it is possible to earn extra balls while playing. I’m just not exactly sure what triggers it. But by collecting pink crystals and using them for upgrades between games, you can get as many as thirty-two starter balls with a max of ninety-nine and unlimited shots. So by design, you won’t be able to last very long on your first attempt. Or even your second. You’ll likely run out of shots way before you reach the core, which is the the end of a stage. As you upgrade your shots, balls, crystal capacity and more, you’ll eventually reach the Meteor’s core and shatter it. 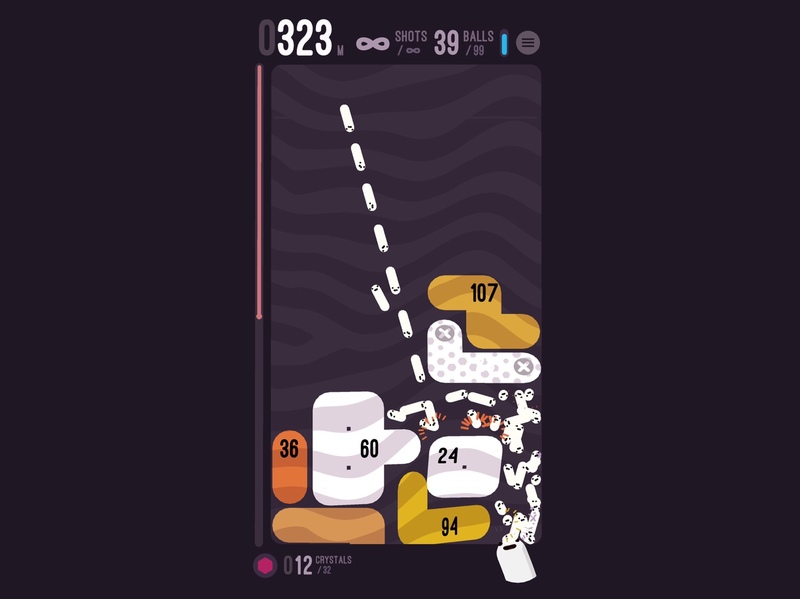 At that point, the game ends and your score is added to the leaderboard based on how few shots it took you to break the core. You can then replay that area to try for a better score or use your crystals to unlock the Moon, which starts off deeper with larger numbers on the bricks and a deeper core. So it’s basically the same gameplay loop — upgrade, reach a new core, unlock a new area until you’ve gotten all upgrades and beaten all areas. You can then unlock the Black Hole, which starts off at a much lower depth and with numbers starting in the hundreds. This is the endless mode, where you try to get as deep as you can and compete with other players. That endgame is, to me, where the real game starts, though it can also be fun to try and improve your score on all the different rocks. 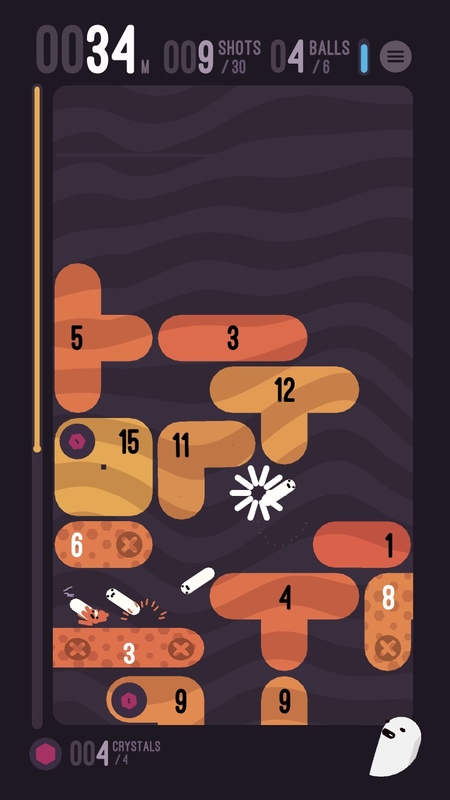 One of the main differences between holedown and the previous games I mentioned is that it’s fully premium with zero IAPs or ads. So you can’t watch an ad for a continue or for extra crystals. Another is the more appealing aesthetic, which helps in keeping me playing, along with the great soundtrack. A bigger change is the rounded corners that cause the balls to ricochet at different angles than you’re use to. But perhaps the biggest difference is how the game feels. The physics are far more satisfying. Instead of balls just floating around, they speed up as they bounce between bricks and become a blur. Shooting the balls at just the right angle so they get stuck bouncing around between four or five bricks is just so great to watch. On top of all that, I like the simple mechanics. There are only two kinds of bricks — regular ones and locked ones. Regular ones disappear if you clear the bricks directly below them. So you can focus on the lower numbers instead of the higher ones. Locked ones have to be destroyed manually and can be a real thorn in your side. For instance, a good strategy is to try and squeeze the balls through gaps so they’ll bounce around and hit more bricks. If you only hit one brick at a time, they’re not going to clear fast enough. But let’s say you don’t have an opening? You may have no choice but to first clear out a brick. And meanwhile, those locked bricks are inching ever closer to the top of the screen while you can’t touch them. Also, the starting position for the ball changes based on where the balls bounced back to the top last time, so that also changes your strategy. If you can’t get a direct shot at the spot you want, you have to try and bounce it off the wall or another brick to get it there, and you might not always be successful. Let’s talk a bit about the controls. You can drag your finger anywhere on the screen to adjust you line of aim, making it perfect for comfortable one-handed play but equally as great for poking at an iPad resting comfortably on your lap. 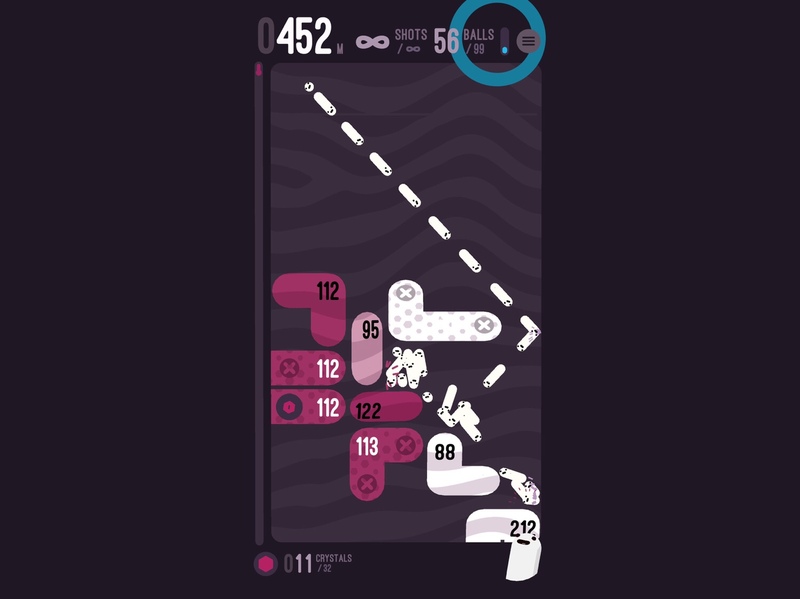 holedown plays in portrait mode on iPhone, but in either portrait or landscape mode on iPad. It’s also a very relaxed game with timer, so you can take as much time as you need to plan out your moves. There’s also no reflex-based gameplay to worry abuse. So if iCloud was working, it would be perfect for both on-the-go and stay-at-home gaming. iCloud isn’t working, though, so I’m mostly limited to my iPad at the moment. I look forward to it getting fixed so I can play the endless mode anywhere I want. Despite playing the game a ton and being drawn to it constantly as my iPad sits next to me on my couch, I do have some complaints. I’m personally not a fan of the grind, the same way I didn’t like the grind in Card Crawl. I loved the core gameplay loop in Card Crawl but hated having to play a billion games just to earn enough currency to unlock all the cards so I could have a genuine chance at competing on the leaderboards. I gave up on that game, but I enjoyed playing holedown enough to stick with it and even restart when it lost my progress. But to me, the real game starts when you’ve unlocked all the upgrades as well as the endless mode. I think upgrades and currencies do have their place in games, but in this instance it felt like an artificial and unnecessary way to stretch out the game’s life span. Beating a level due to gaining more balls didn’t feel so much as an accomplishment as a relief that I was one step closer to being done with the upgrades. I could understand if there was a story or some limitation on the different planets that kept you from just relying on the upgrades as a crutch. But as is, I just felt like the game was wasting my time. It’s a testament to its strength, though, that I stuck with it long enough to unlock endless mode and beyond. Besides the time-consuming grind, having a currency with a cap on upgrades means that the crystals become useless once you have all upgrades. They don’t count towards your score or offer some vanity items you can buy. So collecting them at the end of each game starts to feel silly. I also think holedown needs a way to quit a game and restart when you see you’re close to losing and there’s nothing you can do about it. Or if you start digging on a planet and realized you meant to play a different one, you’re stuck on that one until you win or lose. It’s another way the game feels like it’s wasting my time, and it seems so unnecessary. And last, sometimes there’s a a little too much luck involved. The layout of the bricks could mean the difference between a high score and a loss. That said, any game with randomized levels is going to involve some luck, so I don’t think it’s a huge deal. But it can be a bit obvious when you start a game with everything lined up perfectly for a ricochet effect verses all the bricks forming a tight wall you can’t break easily. Despite my complaints, I have not been able to stop thinking about holedown since I started playing. Even while writing this review, I kept getting distracted by it, trying to beat my high score. It’s a great game to jump into for a few minutes at a time or for hours on end. It even saves your progress mid-run so if you only have a couple of minutes to play, you can pick it up in the same spot later. I do hope iCloud sync is fixed soon so I can be truly obsessed anywhere and everywhere. 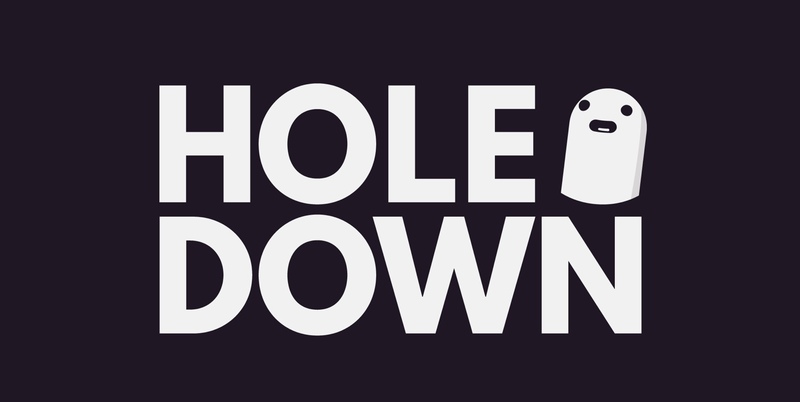 If you’re a fan of Ballz or Brick Breaker but want something a little different and a lot more stylish, give holedown a chance. If you have no aversion to grinding like I do, you should be even happier with it than I am. So download the game here and start your dig to the core.